First peanuts. Then pork. Then ground beef. And now: tomato plants. Sadly, I have not just described the menu at the annual Beyond Green BBQ. Rather, each of the above have been implicated in a recent infectious disease outbreaks. And each outbreak has been exacerbated, if not explicitly caused, by the "big-box" economic mentality -- national distribution networks that aggregate huge numbers of products in confined spaces and then move them across long distances to many destinations in a short time. Experts have repeatedly warned of the dangers inherent in a food system that does this. Now we learn that even the garden centers of large retailers like Home Depot and Wal-mart can put agriculture at risk. ...William Fry, a professor of plant pathology at Cornell, said, "I've never seen this on such a wide scale." 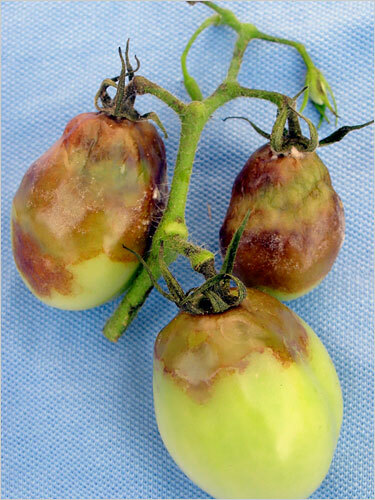 Professor Fry, who is genetically tracking the blight, said the outbreak spread in part from the hundreds of thousands of tomato plants bought by home gardeners at Wal-Mart, Lowe's, Home Depot and Kmart stores starting in April. The wholesale gardening company Bonnie Plants, based in Alabama, had supplied most of the seedlings and recalled all remaining plants starting on June 26. Now it's important to keep in mind that the fungus that causes late blight is ubiquitous and wasn't "imported" into the Northeast and mid-Atlantic by these infected garden center plants. But what these plants did do is introduce active infections -- and with them instantly airborne spores -- which could quickly spark an outbreak. At the same time, if not for the unusually wet, cool weather, the blight was unlikely to have taken hold. And taken hold it has. But what's shocking is how quickly the blight jumped from home gardens to commercial operations -- both home gardeners and professional farmers from NY and PA are already destroying infected plants. The real possibility of a near-total loss of the region's tomato crop exists. Hot, sunny weather, which can kill late blight, could dramatically slow or eliminate the fungus's spread over the next week, experts said. Speaking of which, I wish there was some ray of sunlight that I could pass on regarding the issue as a whole. But big-box stores and national distribution networks aren't going anywhere. I wonder what other pleasant side-effect they'll give us next. Another solution - start your own plants from seed. It isn't hard to do and will cut down on trips to the garden center and is far more fulfilling than just going out and buying your seedlings. There are a ton of mail order sources offering organic and heirloom seeds and helpful how-tos.